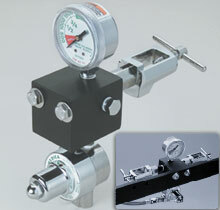 Regulator and yoke assemblies to mount E-cylinders make your anesthesia machine truly mobile. Includes high pressure hose to the machine. We will customize for gases other than oxygen and carbon dioxide.